I've been working (again) with Arun Ponnusamy from Open Road Education on several projects we'll be rolling out together over the next six months. One of them is to work together with our counselors to improve the Collegewise materials, and to start licensing those materials to high schools and private counselors. 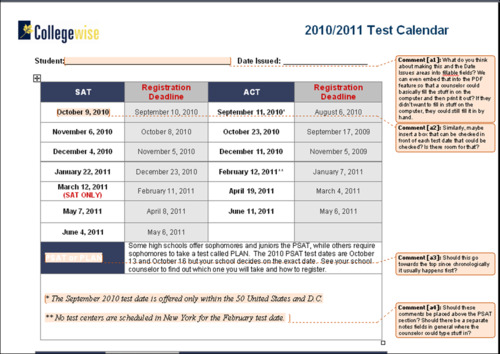 Counselors typically circle the chosen test dates and make a copy of the document for the student and parent. 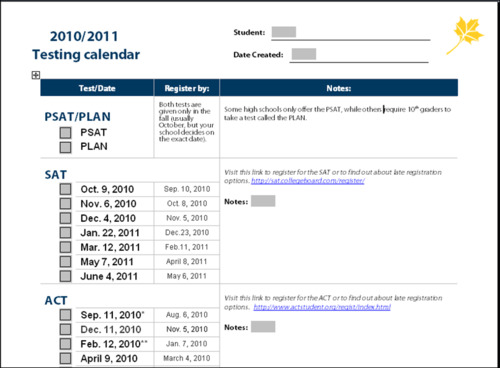 Arun pointed out that if we made all the blank spaces for data like "Name" and "Date" electronic fields, a counselor could save each student's calendar as a PDF and then email it to the student and parent. We also decided to move the PSAT section to the top since it comes first chronologically, and to insert links that would allow students to click and be taken directly to the testing registration sites. Here's a shot of the the first try at our revamped version. We're also working on second page with information on fee waivers, test prep options, Score Choice, advice on SAT vs ACT, advice on how to send scores, etc. There's more to do, but it's a good reminder that everything we make can always be made a little better.